At present, there are over 1,500 images on the CD. Scan quality is generally 300 dpi and in some cases 600 dpi when warranted. All images are in standard JPEG (JPG) format. The CD is self-running (there is nothing to install!) and will run on all standard "Windows"-based PC's (and now available for Mac users on "OS X" as well!). 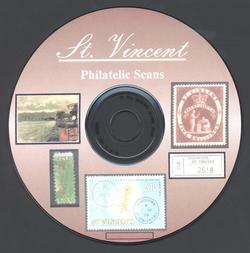 The images are presented in a "FlipAlbum" (reg'd trademark of "E-Book Systems") format, making this truly a "virtual" stamp album! I only make these CD's when you request one, so you will always have the latest and greatest copy ! Due to the sheer number of images, the software now opens up as a "bookshelf" from which you can choose to view individual FlipAlbums based on the topics above. This has greatly improved the performance of the CD. To purchase one of the CD's simply click on one of the PayPal buttons below. All prices include postage (be sure to select either USA or Foreign shipments). I only accept PayPal payments at this time. All major credit cards are accepted through PayPal. You can also specify e-checks through PayPal. PayPal notifies me when the payment has been made and I will ship the CD immediately upon receipt if it is a credit card payment or upon transfer if via e-check (generally 3-5 business days). Click on the button underneath the description, and you will be taken to a secure PayPal screen (if you have never used PayPal before, you will also be given the opportunity to sign up with an account). For those of you that don't trust clickable links, you can also go to the PayPal site at https://www.paypal.com/, login (or sign-up) and send the payment to [email protected] . Note: I only create these CD's when they are ordered by you; that way you always get the latest version!